Long before the backhoe, the six-foot deep hole for the coffin had to be dug by hand with pickaxe and shovel. 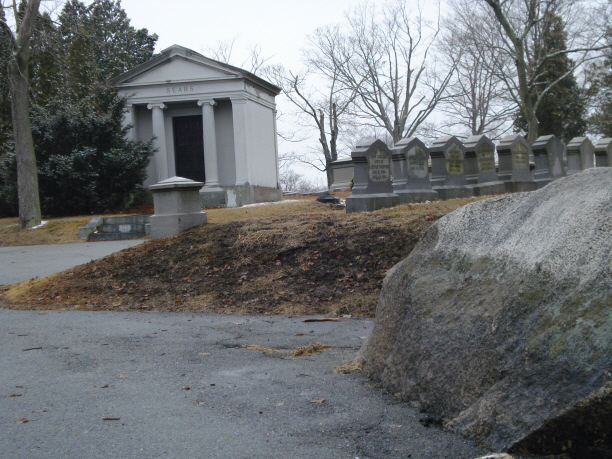 In the nineteenth century, during the iron cold winters in New England, sometimes it was necessary to store the coffin until the January thaw or Spring when the frost was out of the ground. 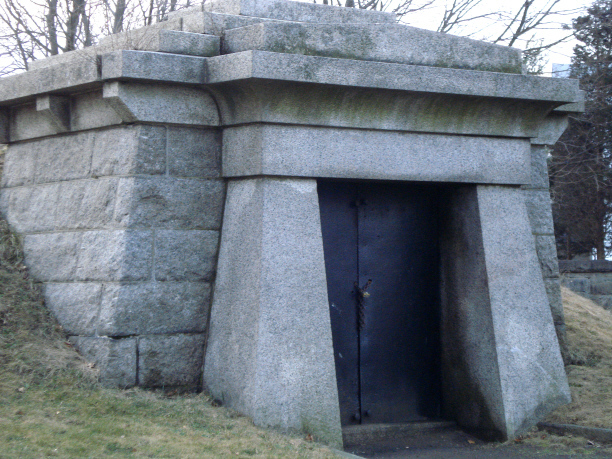 There are several of these Egyptian Revival style holding tombs which were built into hills or mounds, each containing shelving on either side of the interior to hold 6-8 coffins. Today this particular tomb houses lawn mowing equipment. 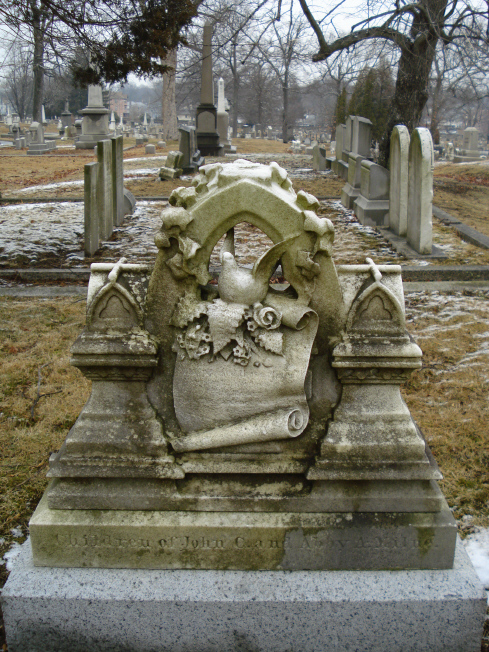 This holding tomb, which is at the west side of the cemetery near the main entrance, housed the two coffins of Abby and Andrew Borden for a week while city medical examiner, Dr. Dolan, arranged for a complete autopsy on the bodies to be held at Oak Grove in the Ladies Comfort Station. It was there that the two skulls were removed and held for trial evidence on August 11, 1892.
n. pl. mau·so·le·ums or mau·so·le·a 1. 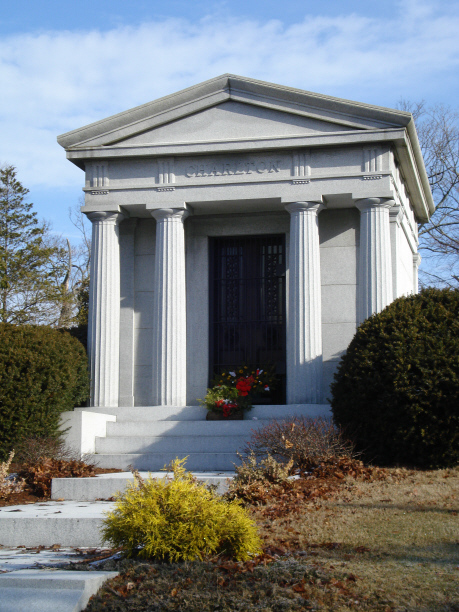 A large stately tomb or a building housing such a tomb or several tombs. 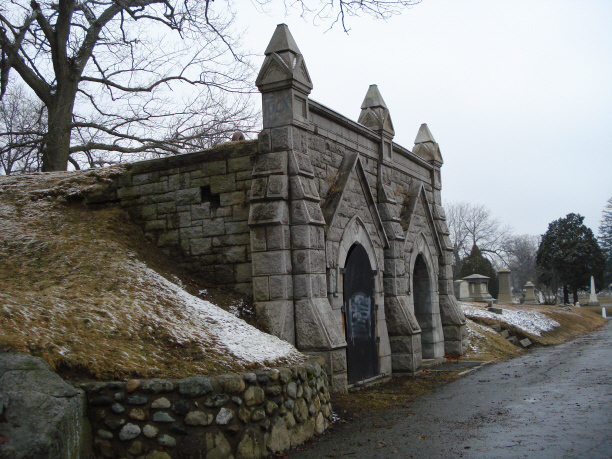 There are three mausolea built in the favored classical Grecian style at Oak Grove and one in a distinctly Gothic Revival mode. 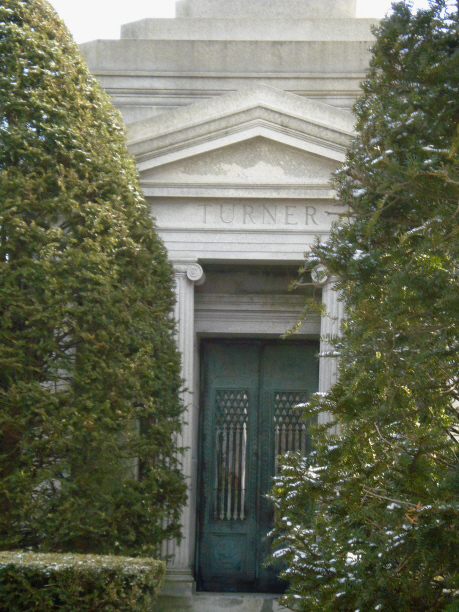 The Turner Mausoleum can be found near the main entry , slightly to the center behind the Civil War obelisk and cannon memorial. 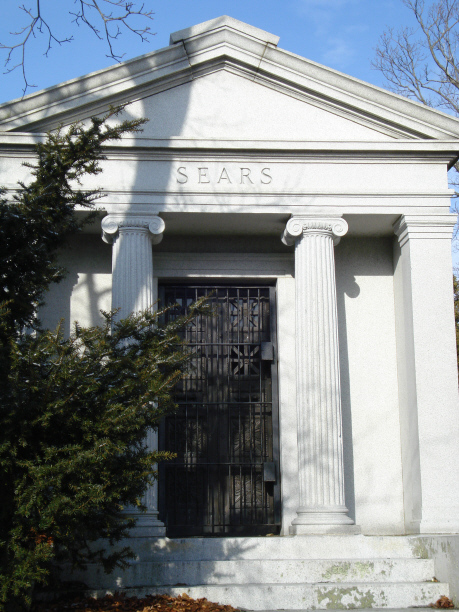 The Sears and Charlton Mausolea are quite close together in the south end. Earle Perry Charlton became a Vice President of Woolworth’s dimestore chain, a position he held until his death in 1930. Charlton Hospital, just down the street from Oak Grove is named in his honor. Mr. Charlton was a great philanthropist and benefactor to the city. 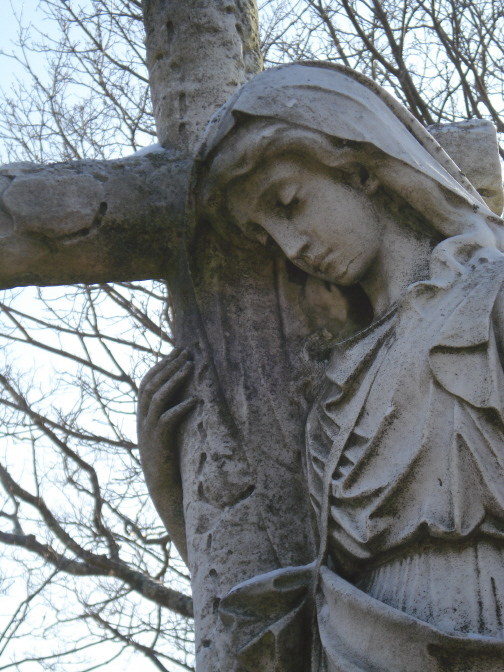 Although these two words are often used interchangeably, there is a difference between a coffin and a casket. A proper coffin is wider at the shoulder and tapers toward the feet. This was felt to be a prudent saving of costly wood as there was no need for width all the way to the bottom. This style is still to be found in Europe today. Coffins were sometimes very simple pine boxes, unlined and unadorned. 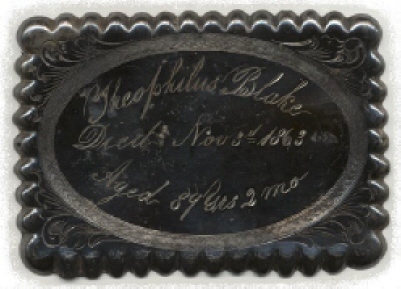 Fancier models were lined, had a coffin plate of brass or silver with the deceased’s name and dates and sometimes a sentiment such as “Our Darling” or “Beloved Wife”, and had three metal handles on each side for the six pallbearers to grasp on the way to the grave. Graves were sometimes lined with fir branches, and after the coffin was lowered, bricked over to discourage graverobbers or other disturbance. It was not unusual for cabinet or furniture makers to do a brisk side trade in coffin making. Lizzie Borden’s father, Andrew J. Borden, was a carpenter by training before branching out into farming and real estate, and although not a mortician, he did build coffins and was an “undertaker” in the sense of providing items needed for a funeral such as chairs, coffin stands, conveyance to the grave, and other incidentals. A newspaper article tells of Mr. Borden displaying a prominent Civil War casualty in the arcade window complete with bunting in the storefront of the furniture business he owned with partner William Almy, so as more citizens could view the body and pay their repects in a time before the rise of the conventional funeral “parlor”. Embalming became a necessity in transporting Civil War dead from a distance back home again, but before those times, the dead were usually quickly buried and not embalmed. For this reason, in their haste, errors were made and those in comas or showing signs of death were mistakenly buried alive. 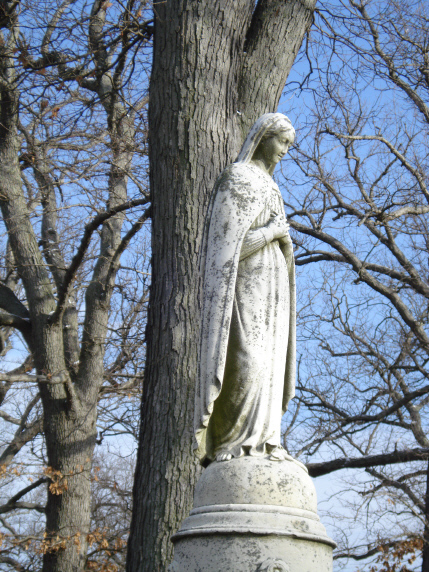 Edgar Allan Poe wrote a story of this unsettling possibility in his 1850 story, The Premature Burial. Many patented safety coffins were invented to prevent this by means of a bell rope tied to the hand of the buried person which would communicate with the living by means of a bell above the ground. Sometimes a flag could be raised, or even explosives ignited by the unfortunate Undead. 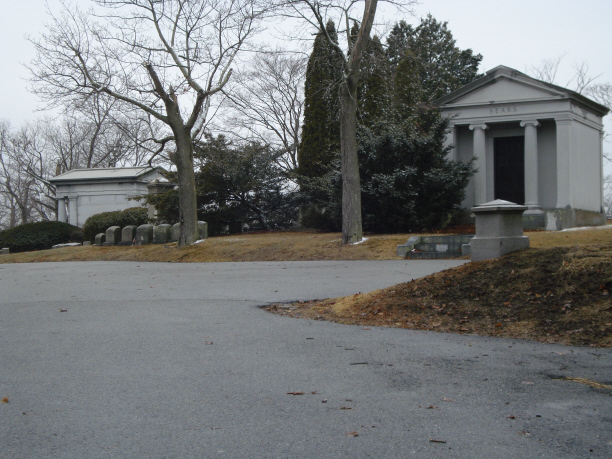 Exhumations over the years have proven that premature burial did indeed take place, however the expressions “saved by the bell” and “dead ringer” do NOT come from this situation. “Saved by the bell” has its origins in the boxing ring, and “dead ringer” refers to substituting a look-alike for the genuine. A casket originally referred to a small chest for storing and carrying jewels or precious objects. 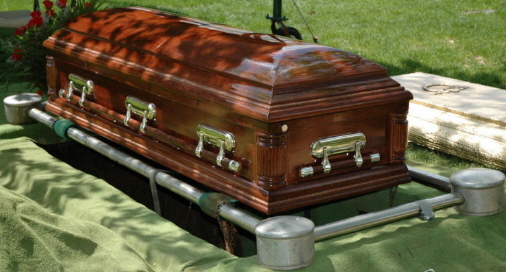 A casket is a rectangular container of the same width from top to bottom. It is generally padded and lined, and goes into the ground after the grave has been lined with a vault. 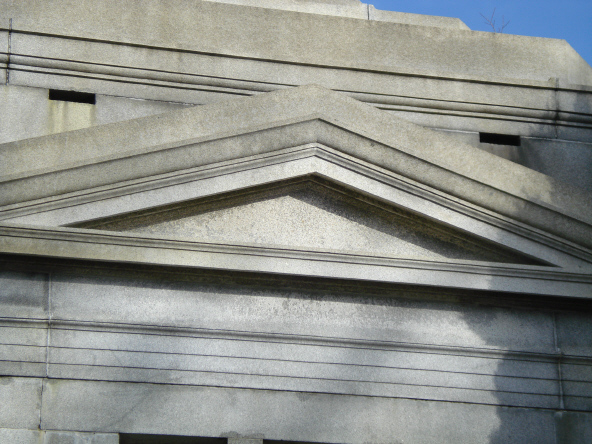 Today cemeteries still use concrete vaults or the new resin “grave liners” which also have sealed lids. Caskets usually open at the top so the head and shoulders of the deceased may be viewed at the wake, and have the customary three handles on each side for pallbearers.